The We-Ko-Pa experience begins miles from the golf club, where you leave city life behind and emerge into the stunning Sonoran Desert that seems the perfect canvas for world class desert golf courses. 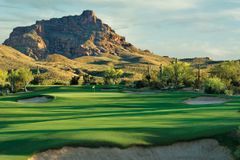 The award winning Cholla Course at We-Ko-Pa is one of the finest in the Scottsdale region and with views of the desert landscape and the McDowell Mountains, Red Mountain, Four Peaks and the Superstitions a round of golf here is sure to surpass all expectations. The Cholla Course at We-Ko-Pa is simply stunning. Pristine fairways follow the naturally undulating contours of the desert and weave their way in and around desert washes, arroyos, cacti and more. Named as one of the Top 10 best new public courses in the world following its opening in 2001, the Cholla Course stretches to a challenging 7,225 yards meaning it will test even the finest players. Like many of the golf courses in the Scottsdale area the Cholla Course is always in magnificent condition and thanks to the intelligent routing of the holes by designer Scott Miller, the course demands good course management rather than a grip it and rip it mentality. This is truly one of the finest tests of golf in the state of Arizona.